Singapore island, aka the Little Red Dot, seen from the perspective of the Singapore Army's crack Red Lions Commando parachute display team. This photo mozaic was stitched together from a video that shows the commandos rehearsing for this evening's 53rd National Day celebrations in Singapore. On the far right (east) of the landmass is Changi. To the left (west) is Jurong and Tuas, with Pandan Reservoir visible as the glistening patch near the top left. The green patch of the central catchment area with the freshwater reservoirs can also be seen. From east to west, about 50km. North to south, a mere 22km. Most number of armoured fighting vehicles in Southeast Asia. Heaviest concentration of tube and rocket artillery. Biggest number of combat engineer bridging rafts. Largest fleet of fast landing craft. More combat warplanes, hunter-killer submarines and MBT types than the neighbours. Region's highest density of SAMs. Neighbourhood's only counter rocket artillery and mortar (C-RAM) system. Unrivalled military training arrangements globally. A currency backed by no natural resources. Open border with the home shore minutes away from the world's busiest sea lane. Exposed to artillery, special forces and rapid deployment parachute forces. High density of ageing population. Virtually no room to manoeuvre on home ground. Heavy reliance on open access to sea and air trade routes. Your back towards the sea any way you face. Many of us do, blissfully unaware of Singapore Armed Forces and Home Team units serving as the city-state's sentinels whose sensors watch above and beyond the border, and can see beyond the obvious. 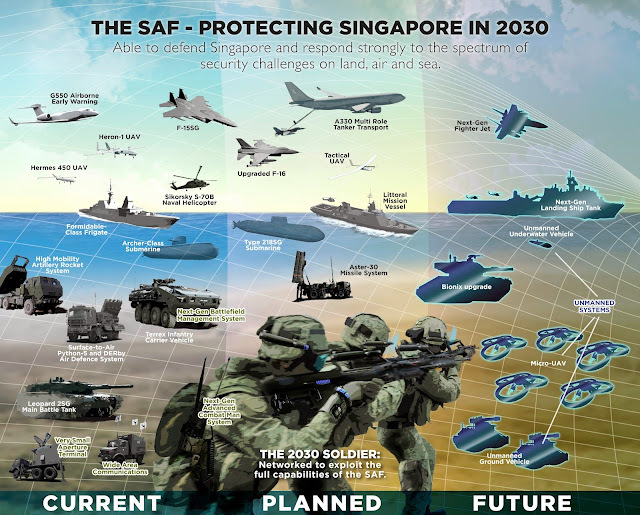 When I first started reading this all I could think is here we go..another chest thumping rundown of weapon system Singapore has. But then I read the rest and it became clear. Singapore is "militarized" for a reason. I never realized they were that exposed. Saying City State is easy. Realizing the implications of that are a totally different kettle of fish. Now I understand how they're thinking. Now I understand the rationale behind their defense purchases and policies.